All parents anticipate and track their child's development, and the majority of the time children meet their milestones on time. However, some parents get concerned when their child doesn't do something by the age he or she is "supposed to." It's even worse when a friend or relative is telling you all the amazing things his or her child is doing that yours is not. All well-child care visits should include specific questions about your child's development and behavior. At the minimum, at certain intervals (9, 18, 30, and 48 months) a formal developmental screen should be administered, using either a parent-completed or directly administered developmental screening tool. 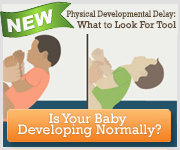 ​The American Academy of Pediatrics (AAP) Physical Developmental Delays: What to Look For Tool can help you learn more about physical developmental delays and how to start a conversation with your child’s pediatrician. Formal developmental screens should also be completed whenever there's a concern about development, whether it be a parent or a pediatrician's concerns. These screens look at all areas of development—language/communication, problem-solving, social-emotional, and fine and gross motor skills. An autism screening should be completed on all children at 18 and 24 months. As long as those periodic evaluations are normal, you can rest assured that your child is developing appropriately and should be fine. When problems are identified, the first step is a referral to early intervention, which is provided under a federal law called the Individuals with Disabilities Education Act (IDEA). Early intervention is available in every state. Your pediatrician may also refer your child to a developmental-behavioral pediatric specialist who can provide developmental and medical evaluations and follow-up for developmental problems. As a parent, you're teaching your child constantly, whether or not you're even trying. Your child is watching your every move and imitating you in words, gestures, and actions. All the while, he's teaching you, helping you become a more responsive parent and eventually bringing you facts, music, adventures, and philosophies you would never have encountered without him.